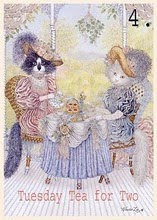 For today's Tea, I will be joining several tea parties and adding my little vignette to Marty's party!! Check them all out on the bottom of this post. Today I am featuring one of my yellow rose teacups. I wish I could tell you where I got it, when I got it an how much I paid, but, honestly, I have had it for so long, I can't remember! I put everything in a basket that I got at a thrift store for $2.00. 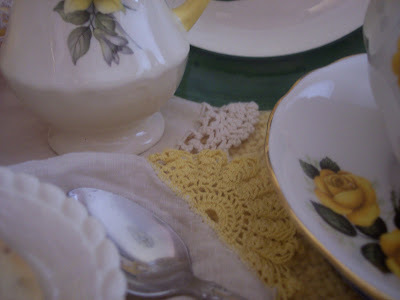 I used several vintage linens, a doily, a hankerchief and a placemat. 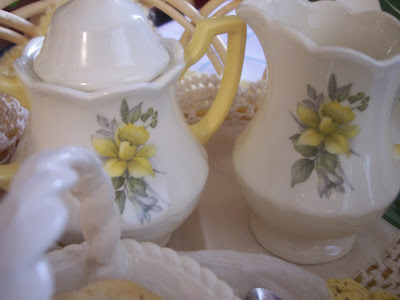 I know the sugar and creamer are not yellow roses, but I thought they still looked pretty with the setting. 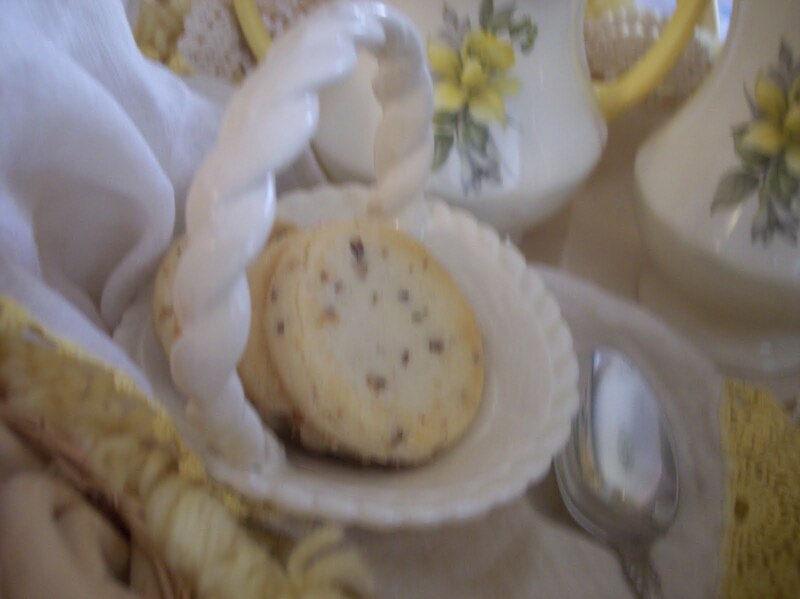 A little ceramic basket with a few pecan sandies always hits the spot with tea. And I just love this rose plate I recently found thrifting. 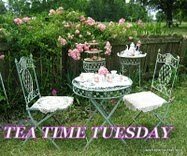 Now head over and join some other fun tea parties today! Diann, Your post is lovely! I really like the yellow and white cups, cream and sugar and plate. Such pretty florals and your presentation is visually outstanding. You have quite a talent for putting together a pretty vignette! Thanks for answering my e-mail - appreciate it. Have a wonderful week! 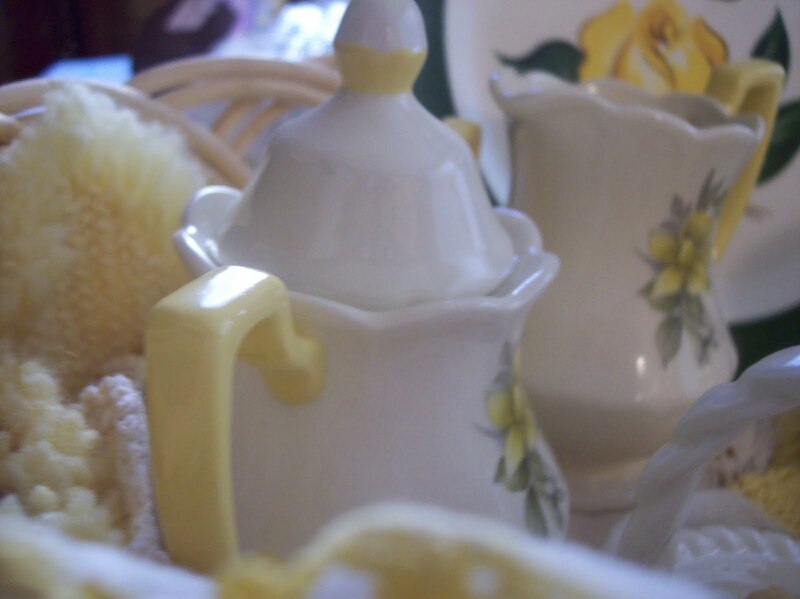 The yellow tea cup is beautiful and all those pieces go so well together, at first I didn't realize you did not get them all together! Beautiful...is it the "Yellow Rose of Texas"? What a wonderful basket of goodies you got yourself! Everything looks so very Spring-like and cheerful. I love white and yellow! 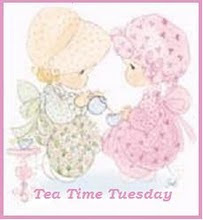 Thank you for joining in for Tea Time Tuesday with me. I have added your link to my post which will be going up in about an hour. Hope you have a wonderful week. Love the Yellow Roses of Texas..
Gorgeous pics and setting.. just lovely! Beautiful tea set. Really nice colors too. Wonderfully charming..dazzling and sweet! Lovely!! yay..that was fun! Wonderful post! How gorgeous, Diann! Just perfect for Spring, and I especially like the cup and saucer. For some reason I think my Mom had something like that. I'll have to ask her, otherwise it will bug me all day! What lovely dishes and your display is just gorgeous! Love the yellow and white. Your yellow tea party is just lovely! 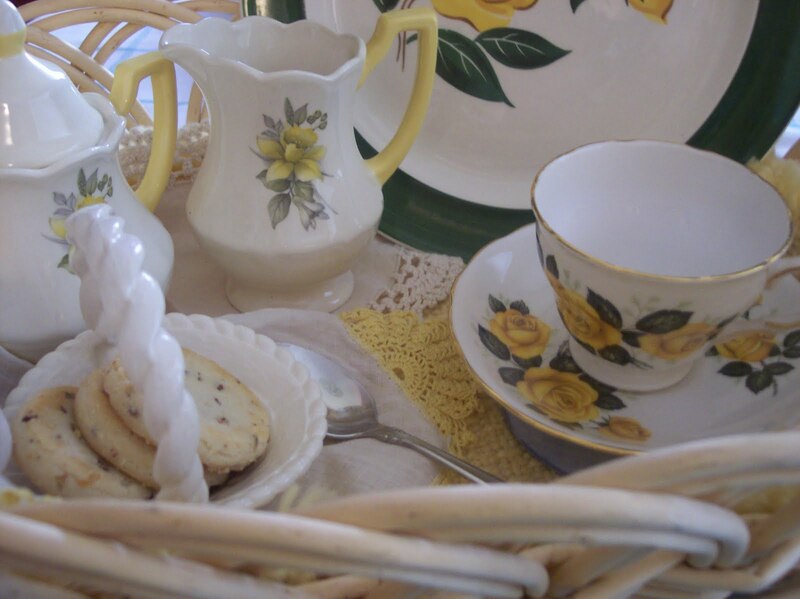 I have a yellow rose teacup much like yours - but mine says "Queen Anne Bone China" on the bottom and it is from India! I enjoyed your post - thank you so much for sharing! You put together quite a lovely tea basket! Love all the yellow flowers. Such a pretty vignette -- very feminine and appealing! And how wonderful that all the different elements were gathered over time -- I know you had fun putting them together like this. That is very pretty! I like the way the sets work together with the yellow. 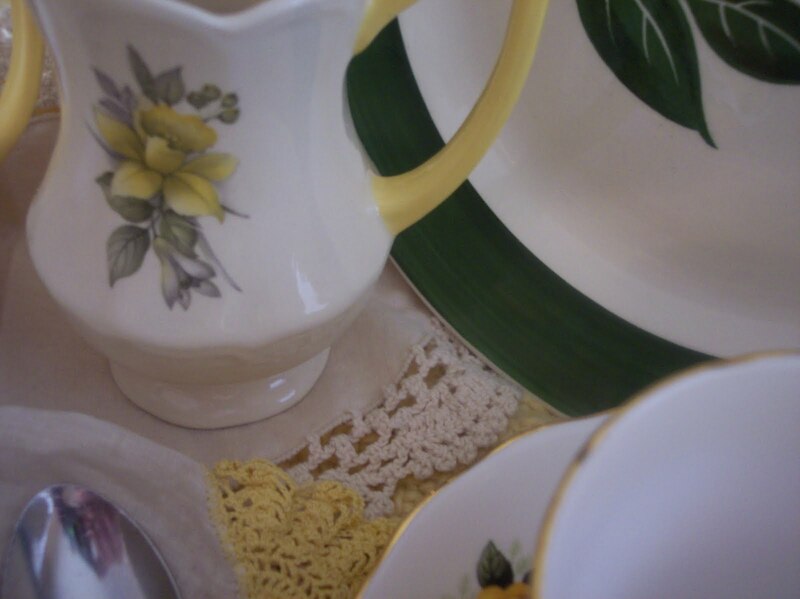 Everything coordinates nicely for your tea in yellows. 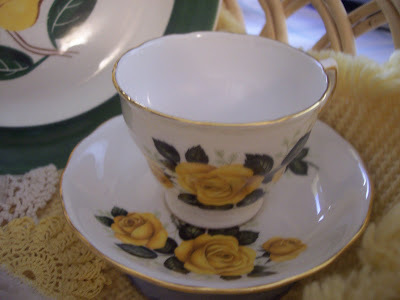 What a perfect yellow rose teacup! And your pretty display of sunshine pretties make me smile :-) And those must surely be lemon cookies!! How funny! When I first looked at the setting...I thought it ALL matched! :) You did such a great job of tying it all together. Very pretty!! Beautiful vignettes Diann. 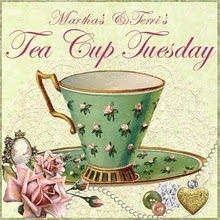 So happy I've joined Martha's tea cup tuesday as i could discovered your marvelous blog. What a coincidence: I happen to have the same royal vale yellow rose tea cup. bought it at some fleamarket a few months ago. wasn't cheap at all but immediately fell in love with the decor and had to have it no matter what. I love your basket filled with sweet dishes. Something about yellow in the spring time! Just lovely. So glad I stopped by, Diann! 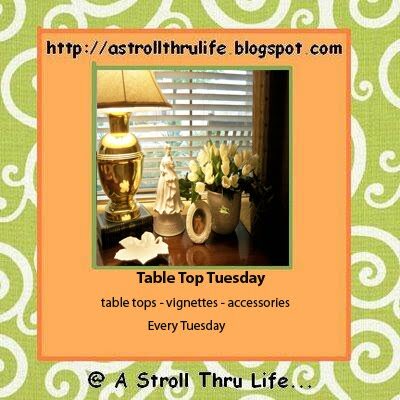 What a beautiful Spring post - your vignettes are beautiful. I love the yellow crocheted doilies. Thank so much for visiting my blog. 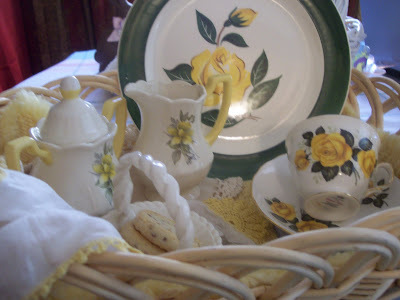 Diann the yellow rose teacup and saucer is absolutley gorgeous!! And yes the sugar and creamer do look pretty in the setting!! 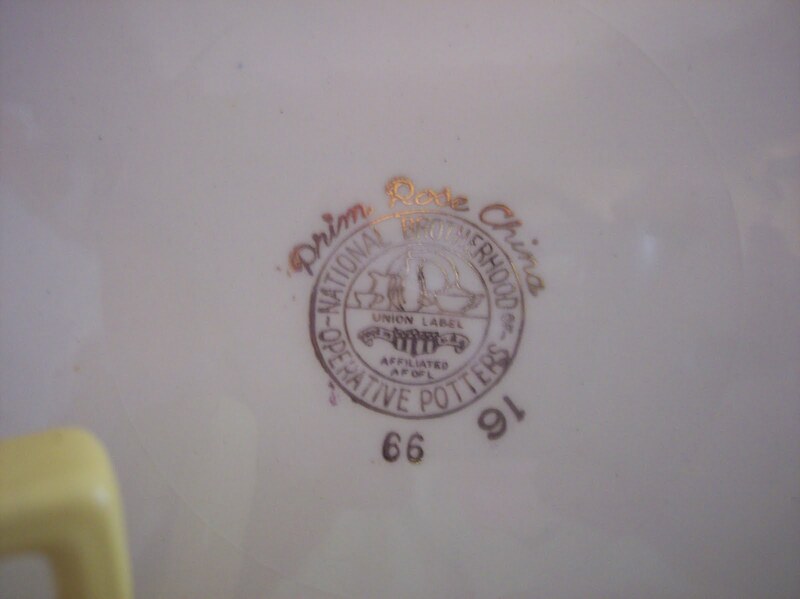 I always appreciate it when someone turns the tea cups over and shows the history -- so interesting and informative. 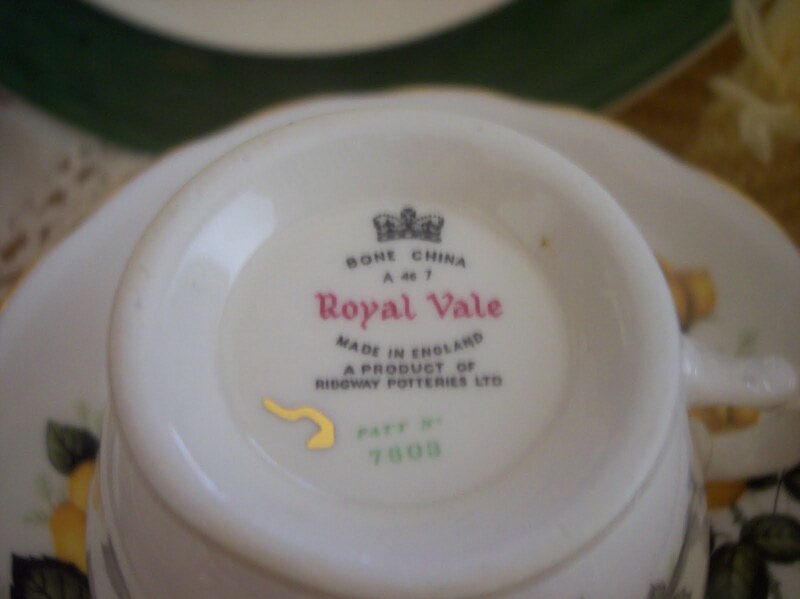 English china is such a treat to see always. Lovely tea setting. 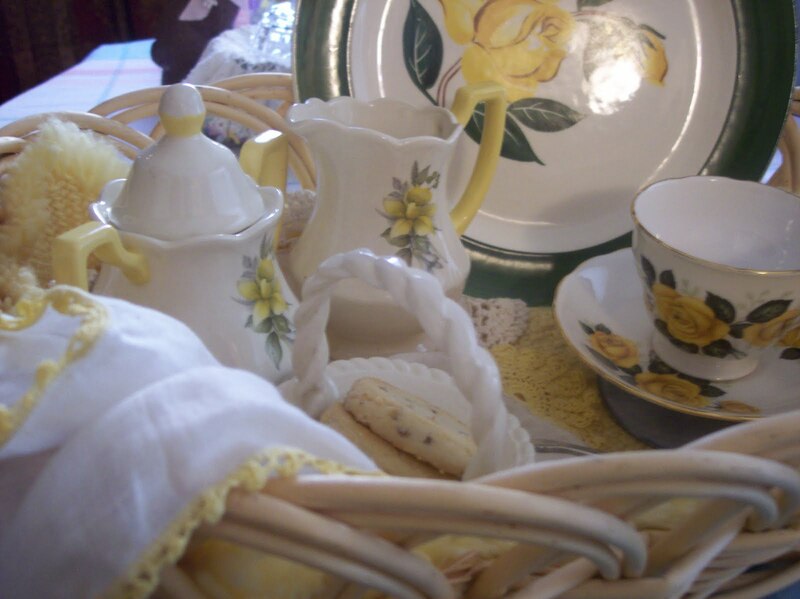 -- Jane F.
I love your yellow rose dishes and how you put everything in a basket with the vintage linens. I am trying to catch up on some posts. 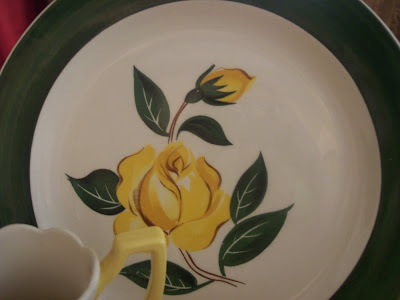 I just wanted to tell you that I absolutely adore these dishes with those sweet yellow roses on them. They are so pretty!! Thank you for joining me for Tea Time Tuesday and my Birthday! I am so late! my daughter told me she was getting married Tuesday on Friday. So I been busy with doing a reception. I just simply love your yellow rose china! It is so lovely! Oh and the linens and doily! Love them! How wonderful to find the plate to goes so great with your china! This Tea vignette is so lovely!